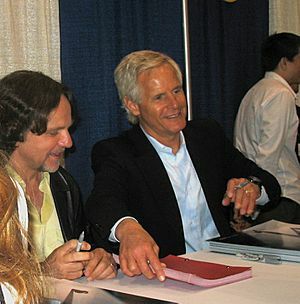 Chris Carter (born October 13, 1956) is an American writer, director, and producer. He is famous for creating The X-Files, a popular science fiction television series. He also created Ten Thirteen Productions, a production company. Ten Thirteen Productions produced the series The X-Files, Millenium, Harsh Realm, and The Lone Gunmen. He has also produced two feature movies, The X-Files: Fight the Future and The X-Files: I Want to Believe. Chris Carter Facts for Kids. Kiddle Encyclopedia.